The world over, lecturing is a common teaching technique. I can still remember back to my undergraduate days the guy who slept in the back row of the 300-seat auditorium during my biology class. The alarm on his watch would go off precisely one minute before the lecture was scheduled to finish. Apparently he was not inspired. Few students were. Sometimes lecturing is unavoidable. And often, business people too are asked to give a 45 minute speech or presentation or even longer. These kind of situations tend to force presenters into a didactic method of teaching/presenting or a "boring lecture." But it does not necessarily have to be that way. A great article in PDF form from the Indiana University (1996, but still very much relevant) entitled The "Change-Up" in Lectures has a good discussion on ways to make longer talks or presentations more effective. They are specifically referring to teaching situations, but the discussion and findings are applicable to most presentation situations as well. Their conclusions are that students' attention spans are about 15-20 minutes maximum, and the length of the attention spans will shrink to as short as a few minutes in the course of an hour-long talk. Whatever the numbers are, one thing is certain: you have got to mix it up and instill a "change-up" during the course of a college lecture or longer business presentations. How about college lectures in Japan? There are wonderful exceptions, but the teaching method of choice in college is didactic: Teacher talks (often from notes), even reads. Students are expected to sit and digest the information. Problem is — and modern learning theory points this out — people are not just sponges but are "wired" for active learning. People may be used to sitting and listening for long periods, but that does not mean it is effective (or that they are either enjoying the experience or learning from it). After seven minutes, have they stopped listening? "...at the precise time for the class to start, the lights went out and suddenly an explosion, and through the smoke appeared Dr.Peterson dressed like a cross between the Arabian Nights and Harry Houdini complete with Cape, Wand, Turban, etc. and we began with the formation of the earth and off we go — every class began with the point of the days lectures. "Next I was very surprised to find he would never lecture for more than 7 minutes without a break. As he said, after that point you've stopped listening so why carry on? During the 3-minute breaks he would play excerpts from Bob Newhart albums. Needless to say, the class time would fly by and he always left you wanting more. All this was done with overheads and a simple phonograph — imagine what he could have done with today's technology." I often say that whatever the actual time may be (for audiences to maintain concentration), it is certainly far less than the typical presentation or lecture today. I like the idea of a "seven minute rule." This does not mean you have to stop everything and play a comedy CD or tell a joke, etc. But it is very good advice to plan for your presentation to change gears about every seven minutes or so. For example: You could show a short video clip to demonstrate a point. Handout an activity in which the audience participates. Take questions to make sure the audience understands you so far, or get examples/personal anecdotes from the audience related to your point. Exhibit a graphic that illustrates your point (in PPT or some other medium). Hit the "B key" in PowerPoint (screen goes blank), move to the center, smile, and tell a very short story that supports your theme or point. Use physical props if appropriate, and on and on. In a statistics class in grad school, my professor brought in a huge gumball machine filled with hundreds of colored gumballs to illustrate issues related to sampling. Brilliant! The lecture was more meaningful, engaging and memorable. We learned the stuff while having fun. Rather than lecture on and on about sampling, she lectured a bit, told stories, and came back to the gumball machine from time to time. The point? 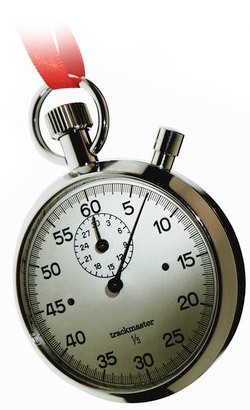 If you are speaking for 20 minutes or 120 minutes, you must break the time up...after seven minutes or so, they probably are not listening anyway, so for who's benefit are you speaking then? Remember The Cluetrain Manifesto? It's the kind of dotcom era book that Tom Peter's surely endorsed in 2000. I remember reading it before I joined Apple back in 2001. One of the Cluetrain authors raved about how "Markets are Conversations!" Or at least, how they should be. Seems pretty obvious now, though many companies still do not get that. The author of that bit is Doc Searls. Turns out that Doc has given a little advice for giving better presentations. It is worth a read. I particularly agree with the idea of "Telling your story." I often stay that it is better to think of your entire presentation as a story. As Doc points out, stories have three parts: character, problem, movement toward a solution/conclusion. The problem in 1998, when Doc wrote this little piece, is the same as it is today: Presenters still focus too much on their products' features. And when they do talk about benefits it is often in an abstract way. Such as, "Our product last quarter increased overall efficiency 75% for 90% of the people who used our product in a recent on-line poll....." Whatever. How about talking about real people with real names? How about talking to actual audience members live? Should not great presentations be more like conversations? Ask the audience questions? Yes, that is scary and unpredictable, perhaps. But is it any different than the conversations we have with people? Are we afraid to ask questions and be honest because we fear what we might hear in return during our daily conversations? Maybe. Sometimes. But most people are pretty straight shooters in their conversations with friends and coworkers. This is natural. This is real. Why should presentations be so different. Audiences appreciate a good story, and audiences want to have a conversation with the presenter (or at least eavesdrop on a good one). For your next presentation, think of it as a 20-minute conversation, complete with examples, anecdotes, and of course a genuine interest in the other person you are talking with (the audience).